Legally-speaking, there is no such thing as “founders stock.” Founders typically receive common stock, i.e. a class of stock with no special rights or preferences. Although there have been efforts by various organizations to promote the issuance of special classes of stock for founders that contain “super voting” rights or similar protective provisions, in practice, those provisions hardly ever survive the first round of outside investment. In the vast majority of cases, we recommend sticking to the K.I.S.S. principal and issuing common stock to the founders. Each founder should sign a subscription agreement (often alternatively called a stock purchase agreement) with the company to purchase their shares of stock. The purchase price is usually nominal; often less than a penny per share. However, the subscription agreement should also include a contribution of any intellectual property, domain names, business plans, or other assets that the founder has created further the business. For any company with multiple founders, each founder should enter into a vesting agreement with the company. The vesting agreement will require the founder to work for the company for a defined period of time in order to fully “earn” their founder equity. If the founder ceases to work for the company for any reason before the shares are fully-vested, then the company has the right to repurchase the unvested shares for a nominal amount. In essence, the unvested shares are forfeited. To use a simple example, if the founder has a four-year vesting agreement and is fired after two years, then 50% of that founder’s equity would be forfeited. Why would a founder voluntarily agree to this? Because in most cases, each founder is going into this business with the expectation that all of the other founders will be actively working on the business. If a founder leaves, regardless of the reason, that expectation has now been frustrated. Absent a vesting agreement or some other agreement in advance, the other founders will have no way to recover that equity, other than a negotiation with the departing founder, which will usually be expensive at best. A former founder who still holds significant equity creates a litany of potential problems. Aside from the potential resentment that the remaining founders may feel, that chunk of now-passive equity may be a deterrent for future investors. We have seen at least two companies fail in large part due to this issue. The vesting period is normally three to five years, with four being the most common. Vesting normally occurs monthly over that period; however, if the founders are relatively new to each other, then a “cliff” for the first year may be appropriate; cliff vesting means that the first tranche does not vest until the end of that cliff period. In some respects, a cliff is like a beta test to make sure the relationship will work. 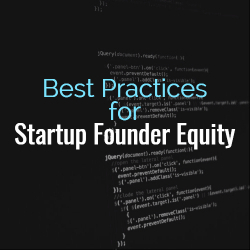 Founder equity also normally would fully vest upon a sale of the company, although this may not always be the case for equity incentives that the company issues to future employees. One important tax issue for founders to understand is that, if they receive restricted stock (i.e. stock subject to a vesting restriction), then, in most cases, the founder would be well-advised to file an 83(b) election with the IRS. Absent this filing, the founder will pay tax on the fair market value of each tranche of shares when it vests at the fair market value on the vesting date. If the company grows quickly, one might imagine that these tax bills could grow exponentially. The deadline for filing is strict; the filing must be made by mail no later than 30 days after the date the shares are issued. Analogous to the expectation that founders will all actively work on the business is the expectation that, at least initially, the founders will get to decide who the other shareholders are. One way to protect this expectation is by creating a “right of first refusal” in favor of the company or other stockholders. A right of first refusal gives that company or other stockholders the right to match any offer to purchase shares of the company’s stock. So, if a founder wants to sell some of their shares, and a potential buyer makes an offer, then the company or other stockholders can match that offer and keep the shares from going to a potentially unknown party. Typically, the right of first refusal is added to the company’s bylaws so that it automatically applies to new shares of stock whenever they are issued. Lastly, founders should include a lock-up agreement in their subscription agreements. A lock-up agreement is an agreement by the shareholder not to sell their shares for some period of time (typically 180 days) following an initial public offering. Underwriters fear (often rightly) that a large number of sales by insiders or former employees immediately following an IPO may depress the stock price. However, a lock-up agreement typically cannot be imposed without the agreement of the stockholder. In order to avoid the difficulties in trying to track down former founders and employees at the time of your IPO, include a simple lock-up agreement in your subscription agreement. By following these best practices, you and your co-founders will establish a solid foundation for your startup and, hopefully, your future success! 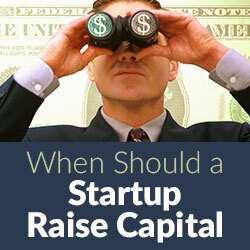 For companies seeking outside investment capital, the starting point is to develop and hone an effective pitch. The goal of the initial pitch is to get the potential investor interested enough to have a more in-depth discussion, which will hopefully lead to a term sheet and eventually to funding. Accordingly, there is little an entrepreneur can say in an initial pitch that will close the deal right then and there. However, there are a number of mistakes an entrepreneur can make in an initial pitch that could be red flags for the investor, and this article focuses on a few of the most frequent. The first mistakes actually happens before the pitch. 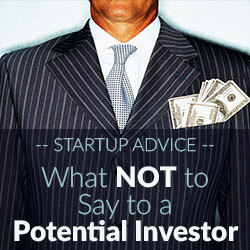 Never pitch an investor who demonstrably has no interest in that business. Many investors have a specific investment thesis focused on a particular stage, a particular industry, a particular geography or other characteristics. It is usually fairly easy, either through research or conferring with people who know that investor, to find out what those are; many investors have them available on their website. Pitching an investor who would not invest in the business even if they liked it is a waste of everyone’s time. Never tell a potential investor that the business has no competition. Every viable business has competition. When an investor hears “no competition,” it usually means one of three things, none of which are good for the entrepreneur. First, it might mean that the business model isn’t viable; in other words, the reason there is no competition is because it’s not a good idea. Second, it might mean that the market for the idea has not yet developed. Being too early into a market is often just as big of a problem as being too late, because educating the market is difficult, time-consuming and expensive. Lastly, and most commonly, saying that there is no competition often means that the entrepreneurs either have not done their homework thoroughly enough or lack an understanding of the marketplace. Professional investors want to invest in businesses that have a large market opportunity, because a large market opportunity is the only way for a business to scale into the sort of return on investment that those investors are seeking. If a pitch shows too small of a market opportunity, those investors will not want to invest, even if the business might be a good one. If market opportunity really is a small one, then the business may not be the type that is appropriate for professional investment, and the entrepreneur should consider other paths to raise capital. Otherwise, think carefully about the actual market opportunity and how to describe it in the pitch. Savvy investors understand that projections are not guarantees. However, they expect the projections to be rational and based on reasonable and verifiable assumptions. Pitches that show unrealistically rapid growth or profitability fail to pass the “smell” test and may turn off a potential investor. Give very careful consideration to those numbers. A good pitch is nothing more than a good start, but a bad pitch can be a quick ending for a potential investment. 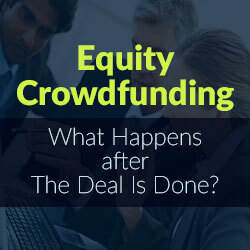 Equity Crowdfunding: What Happens after The Deal Is Done? Although equity crowdfunding is still a relatively new financing tool for entrepreneurs, much has been written about the process. But what happens after the fundraising is done? While more hard work lies ahead for the entrepreneur, there are a number of ways to ease the transition into the next phase of a company’s life cycle. Like all other sales of securities, equity crowdfunding offerings must comply with state and federal securities laws. Equity crowdfunding offerings rely on one or more exemptions for private offerings, and some exemptions require the company to make filings after the offering begins. For example, the most widely used exemption, Rule 506 under Regulation D, requires that the company file a Form D with the Securities Exchange Commission within 15 days after the first sale. Some states may also require a Form D or similar notice filing. Whatever the case, it is important to ensure that all required securities filings are made timely and accurately. Failure to do so can, in extreme cases, limit the ability to rely on those exemptions in the future. The management team and board of directors must understand that they have fiduciary duties to the shareholders of the company. Often, when companies raise money via equity crowdfunding, that money is the first “outside money” invested in the business. At that point, no longer are the founders accountable only to themselves. Officers and directors have serious fiduciary duties of care and loyalty, and failure to heed those duties can lead to significant personal liability. In addition to these fiduciary duties, officers and directors should feel a heightened sense of accountability since someone else’s money is now also at risk. Shareholders have a right to expect officers and directors to act as responsible stewards of their money, and if they are concerned about this, expect to receive questions and feedback to that end. Transparency is a key investor relations tool for proactively addressing these sorts of concerns. Many early-stage companies publish a private newsletter to investors to regularly update them on the company’s progress, and to discuss challenges and setbacks and how the company is solving them. A savvy investor reasonably expects that the company will hit road bumps along the way, but how the company’s leadership handles them defines their relationship with investors. Honesty and transparency about any challenges and proactively addressing solutions are the best ways to inspire confidence in the company’s management of their investment. 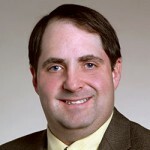 Furthermore, an investor may bring a unique perspective or beneficial relationship that may provide an otherwise-unknown opportunity to solve a challenging issue. Some companies also provide regular financial statements to their investors along with an annual update to the company’s capitalization table, and may make periodic requests for warm introductions that the company is seeking. What form it takes and what information is included will vary from company to company, but the important takeaway is that a regular and honest flow of information to investors can be an important tool for managing investor relationships. Ensure that capitalization table and shareholder information records are kept current at all times. Crowdfunded companies may have a little more work to do than other companies, because they may have larger numbers of small investors to manage. Even then, this recordkeeping is very easy to do if performed as a matter of course each and every time something changes. On the other hand, falling behind even a little can lead to a mess down the road, and that can lead to some uncomfortable problems, and even additional legal and accounting expenses down the road. Similarly, periodically reach out to the crowdfunding investors to confirm that their contact information is current. Chasing down a lot of signatures in order to close a later transaction is painful enough without the added hassle of trying to track down shareholders whose contact information is no longer current. Lastly, remember that equity crowdfunding investors are no different from other investors in one important way. If you build a great company, everyone will be happy!